Today's post is another in my brand focus series and this one is from one of my all time favourite brands - Benefit. I always remember Benefit being one of the first higher end brands I had makeup from and I got their They're Real Mascara in the airport and was amazing at what it was like. Recently they seem to be relaunching a lot of old favourites into new packaging and bring out other new products. I have been using this for years now and its one of my favourite contour products, i've almost finished the box I'm on so a repurchase will happen soon. This is a cool toned matte bronzer shade, that is better for paler skin tones I would say. It has good pigmentation but it isn't too intense and perfectly contours my cheeks and warms up the skin. Benefit relaunched their brow range last year and some of the new products were insane but this brow gel is still an old favourite of mine. I like this as it tints my brows, fills them and in tidies away any stray hairs. I tend to use this after filling them in already and it just adds a bit more depth to my brows. 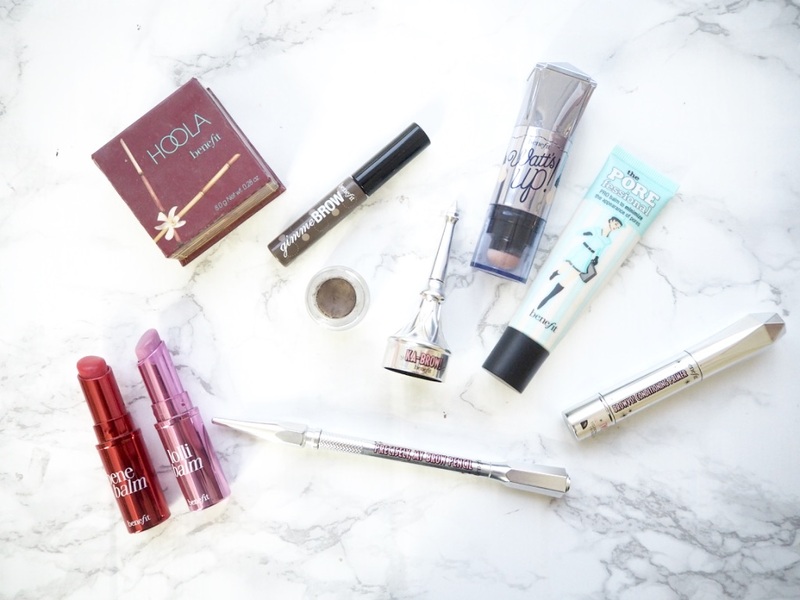 I'm the biggest highlighter fan and Benefit have quite a few I need to try but Watts Up! is one I already own but need to use more. I tend to favour powder highlighters over cream but I have been swayed by this one. Its more of a glowing product rather than shimmery and gives a soft focus peachy glow. I have just finished my tube of this so this will be another one I will repurchase. I love the silky texture of this and it evens out all of my pores and imperfection creating the perfect canvas for my foundation application. There is a slight tint to its colour which I find evens out my skin tone and any redness I may have. I picked this up after hearing one of the sales assistants mention how amazing it was at staying in place even on holiday around the pool. This is quite a waxy formula that doesn't glide on as easily as other creamier formulas do but I think that helps it stay in place for even longer. I find that this fills my brows in well and doesn't smudge or wear off throughout the day. These are some of my fave everyday lip products as they give a nice tint of colour but also keep the lips soft and moisturised. I have Benebalm, a red tint, Cha Cha Balm, a peach tint, and Lolli Balm, a bright pink shade. I dont tend to use brow pencils and instead prefer pomade but this one has changed my mind slightly. This is a very fine tip so you can create soft hair strokes and give a natural soft brow look. Since I've been usual this my brows have never been so full and thick, my brows are thick and bushy so I'm always on the hunt to give them a bit more depth and it does just that. I apply this every night and after a few weeks I could see how thick my brows were getting. Have you tried any of these Benefit brow products? Hoola bronzer is my holy grail bronzer, I absolutely love it! I see a lot of my favourites in here! Benefit has a ton of great things!